As a church family, we believe that everything rests on these two values: "To love God and love your neighbor." It is because of this great and powerful truth that our vision is to be a Gospel centered family that loves God wholeheartedly and serves others sacrificially. "To make disciples who make ​disciples"
Our church is sold out to living the "Great Commission" in Matthew 28:19: "Therefore go and make disciples of all nations, baptizing them in the name of the Father and of the Son and of the Holy Spirit..."
As believers and church members, we must not get caught up so much in our own lives and doing the "work of the church." We believe that if a church becomes to inward focused, it becomes nearly impossible to grow spiritually. Therefore our mission is to make disciples who are making more disciples. We believe one of the best ways for a disciple to grow is by discipling others. What kind of disciple are we striving to cultivate? One who loves God wholeheartedly and serves others sacrificially (Matt. 22:36-40). "To encourage and equip disciples to grow in faith, community, and venture"
Everything that we do, (Sunday service, Sunday school, Life Groups, and Prayer Meetings), is for the edification and encouragement of the church to grow in our core values: faith, community, and venture. Faith refers to our personal relationship with God. Community is the arena in which we experience and show our love of God. The value of venture directs us to get outside of our comfort zone and show the love and mercy of God to the world. We believe that disciples must be equipped and trained, so that they can go out and make more disciples. As our church grows in faith, community, and venture, we hope to see God do great works in our communities. 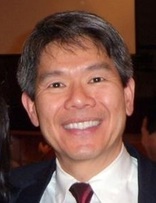 Albert Yip is a graduate of Moody Bible Institute and Northeastern Illinois University with a MA in Counseling. He has been in ministry since 1986. Pastor Albert oversees the Teaching, Counseling, Bible Studies, Prayer, and Vision at SBBC. Sebastian Yip has an MDiv from Moody Graduate Seminary and a BA from UC Berkeley. He has been in ministry since 2011. Sebastian oversees the Worship, Reach, and Young Adult ministries at SBBC.